Federation University Australia > About us > Our university > Our history > Geoffrey Blainey Research Centre > Honour Roll > DULFER, John C.
On 27 September 1917, John Charles Dulfer received the President's Medal for the most meritorious student of the year in Science at SMB. He was one of only two students to ever receive this prestigious award. Dulfer, who also held one of the Government's senior technical scholarships in hydraulic engineering, was awarded an Associateship in Mining Engineering in 1921. 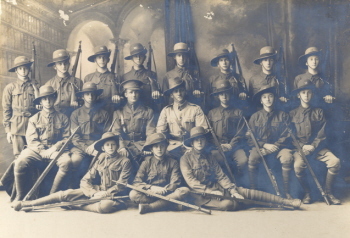 John Dulfer joined the Ballarat Junior Technical School Senior Cadet Team in 1917, and was a member of the champion 1918 Team which won competitions at Stawell, Colac, Maryborough, St Arnaud, Mildura, and the Royal South Street Society's 'A' Grade event. According to his son, William J. Dulfer, his father worked with the British Phosphate Commission (BPC) on Nauru Island. After completing the company's standard term of two years John Dulfer returned to Australia where he worked for a time as a land surveyor before joining the National Development Commission as a civil engineer. He remained in their employ until the early 1930s when he returned to work with BPC at Nauru for a further 10 years. John Dulfer died in 1955 aged 55 years, but not before he and his wife had both 'cheated' death. "When it became necessary for Mrs Dulfer to leave the island due to illness, arrangements were made for her to return to Melbourne. However, she missed her ship; shortly afterwards it was torpedoed and sunk. Mrs Dulfer later made her way to Melbourne where she remained until she was fully recovered. "In the middle of 1941, John took leave from his posting on Nauru Island to join his wife in Melbourne. The Japanese joined the Second World War soon afterwards. As a consequence, BPC informed John that, as he was a senior member of their staff, he was required to remain in Melbourne. Shortly afterwards the few staff remaining on Nauru Island were executed. One of only two of a kind... In 1963 William Dulfer loaned the meritorious medal to H.E. Arblaster, principal at SMB. In 2005 he donated it to the University of Ballarat Art &: Historical collection (Reg.No. 4194). The medal is caste of 15 carat rose and yellow gold. Image Caption RHS: SMB Cadets, 1918 (Cat. No. 202) Back: R. Hirt; P. Trompf; J. Nicholls; R. Serjeant; J. Jones; A. Hannah; A. Duncan; L. Lindsay. Centre: H. Ashley; H. Beanland; J. Finlayson; F. Larkin; G. Chambers; A. McCallum; T. Shattock; E. Rowsell. Front: Sgt A. Roe; JOHN DULFER, Mjr Tucker; Lt H. Wakeling; Sgt-Mjr Reeves; Sgt K. Krahnert; W. Middleton.